Cell Phones, Everyone Has One! It has been quite a few years since Bob Dylan wrote and sang, “the times, they are a changin’.” What is true about most great writers is also true of Bob Dylan in that his words still very relevant today. One place they are certainly relevant is in the world of marketing. The days of reaching everyone through one or two mediums, like a newspaper ad and radio spot, are gone. I am also going to go so far as to say those days are not coming back. Our customers have so many places to spend their time and get information that we must be in a multitude of places to reach a large percentage of them. Of course, this can be a struggle. Some people are finding a real solution with the powerful tools Turnaround Tour ShopPros has brought to the table within our Tomato Project. In case you have not plugged into the Tomato Project’s weekly Tuesday call, or listened to the replays on our site (click here to find replays), let me give you a quick peek at what we have. Complete customer engagement! I use the term “customer” in its broadest term, meaning both your external customers (those who buy from your business) and internal customers (those who run your business). The “TOMATO” in Tomato Project is an acronym for “Top Of Mind Awareness Through Others”. Like any good tomato garden, you start by seeding new soil. We offer Mudlick Mail to do this. In order for tomatoes to grow, we need to have frequent rain. Our rainmaker for the project is Social Zing with its suite of online marketing tools. Finally, we must have sunshine to make our garden grow. Our sunshine for the Tomato Project is SendOutCards. Now you can touch prospects in their mailbox or online. You can also touch your customers online or touch their hearts with the powerful tools available in the Tomato Project. One of the modules Social Zing brings to the table is what many would call the New Kid on the Block in marketing. I am talking about text message marketing. I have found, as with anything new and unfamiliar, there has been some confusion about using it. Some are even hesitant, thinking it would not be welcomed. I assure you, with the correct implementation, people will love it. I believe a picture is worth a thousand words and, therefore, I went surfing for a picture to help us understand the magnitude of text message marketing. 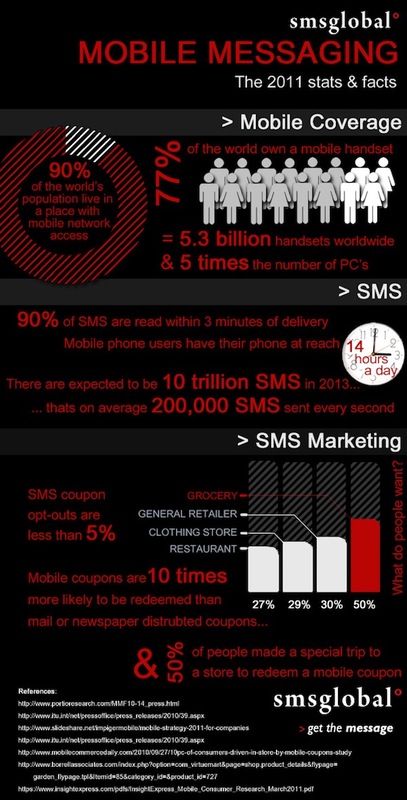 Text message marketing can bring big rewards. I believe if you give your customers the option of receiving text messages many will happily opt in. Since the Social Zing program allows you to place contacts in groups, you can even have different text opt in options. For instance, if a customer really did not want to hear about any monthly specials, but did prefer to have her service reminder by text, you could easily accommodate the customer. Please contact Turnaround Tour ShopPros and say Yes, I want to know more about the Tomato Project. One of us will get back to you in a very timely manner and get answers to any questions you have about MUD, ZING or SOC. Most people know that in business, relationships are everything. Moreover, everybody knows that the internet and relationship marketing are here to stay. Some people are staying on top of social engagement game through the innovative tools found in the Tomato Project. We would be happy to get you all the information you need to see how these tools could work for you too.